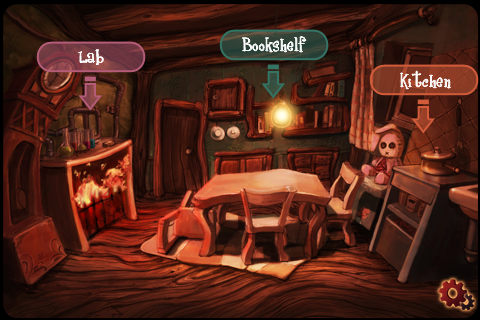 Peter Ha over at Techland has posted a mini-review of “American McGee’s Crooked House” inside a feature on “Top 10 Hottest iPhone Games Right Meow“. The latest from American McGee’s Spicy Pony is dark, vile and wicked fun for a puzzle game. It’s simple, really. Help your little mouse friend escape the Crooked House. A handful of the puzzles (there are 72) are difficult to solve but I’d rather be challenged then waste $2 on a mindless game. Speaking of Crooked House, our iPhone dev team Spicy Pony is putting the finishing touches on an iPad version of the game. It’ll feature higher-res graphics and a number of improvements suggested by users like yourself. The iPhone version will receive an update at release of the iPad version. More reasons to get crooked now! It’s a relatively simple game that tests both dexterity and IQ – hence the name DexIQ. It’s a fun little game that only costs $0.99. Despite the graphics, the game is challenging as can be. It makes my brain hurt. That, or, I’m still feeling the effects of this past weekend. I challenge you, Techland reader, to download the game and post your scores. I’ll beat you. I’ll beat all of you. If I don’t then I’ll send you some free stuff (Blu-ray movies, Xbox 360 games, etc. ).